One of our recent patients from the UK tells us how he suffered from dentist phobia during his teenage years and how he finally overcame it with the help of a well trained and sympathetic dentist. He found the same reassuring, pain free treatment here with Dr. George Antonopoulos. He just had his most visible crowns updated and saved 75% during his vacation in Crete. My name is Patrick and I live in the UK. I recently visited Gentle Dental Abroad in Crete for an update to my old dental work. First I have a confession to make, and I am a little shy about revealing to you. I suffered from extreme dental phobia. A dreadful visit to the school dentist back in the 1960’s kept me away from much needed dental treatment and gave me several bad teeth. Back then there was simply no sensitivity or thought of minimising trauma to nervous patients. As a teenager I suffered from extreme dental phobia. Sometimes these overwhelming fears are irrational, and some like my own stem from one single event. The source of mine was my final childhood visit to the school dentist in the UK. 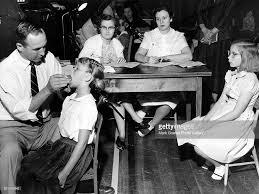 Back in the 1960s our National Health Service insisted that every school child had to undergo a yearly oral inspection. It was an event that most of us dreaded. The chairside manner of the dentist was much like someone displaying a horse for sale at a market. Your mouth would be yanked open, probed, scraped and poked painfully. Even if you had nothing wrong with your teeth, you would come out with sore gums and a tear in your eye. A nearby note taking nurse wrote down what the dentist shouted in a brusque voice, she handed me a form with a date and time written on it. I think dentists at the time could be fully trained by the Army? Moments later it seemed, I was in the street feeling awful. I swore that would be the very last time I visited his torture premises. In those long gone days there was simply no sensitivity or thought of minimising trauma to nervous patients, or even treating children who were frightened. Love for sweets, poor oral hygiene, no dental visits meant I developed cavities and toothache. My dental fear kept me away from the dentist, despite suffering from acute pain and lack of sleep during the night. I didn’t visit a dentist for the next 23 years. But that’s not all. Coupled with my fear of dentists, was my equally powerful love of sweets and cakes. It was a relationship created by the Devil himself. This fatal combination sooner or later meant that I developed cavities and toothache. I now know that I have a small lower jaw with overcrowded teeth. I did brush them as best I could, but I don’t remember anyone telling me about the spaces between my teeth. Dental tape or “floss” would have been my salvation. I don’t even think there was fluoride toothpaste back then? Toothpaste actually had sugar in it. You may not know this, but here in the UK we have the best cakes, biscuits and sweets of anywhere in the whole world. Perhaps everyone says that about the confectionary made in their own country? Back then sweets and bad carbs were regarded as a kind of health food. They were also heavily advertised on our new-at-the-time commercial television. Sugar laden and most popular “Mars Bars” were supported by the slogan “A Mars a day, helps you work, rest, and play!” Where’s the danger in that? There were times during my dentist-free years that I suffered the kind of tooth pain that I wouldn’t wish on anyone. Crazy though it may appear, I still didn’t get treatment. The acute pain was preferable to actually going to the dentist. That’s how bad my phobia was. I was now an adult with a mouth full of problem teeth and yet Superman couldn’t have dragged me for a consultation with a friendly dental professional. During the daytime other distractions can take your focus off the toothache agony, but when it’s dark and you are alone at night, the pain is unbearable. It consumes every though. There comes a time when paracetamol or aspirin just doesn’t calm it down. As the years went by, I couldn’t blame my lack of maturity for this looming and ever present phobia and accompanying pain. I was now an adult with a mouth full of problem teeth and yet Superman couldn’t have dragged me for a consultation with a friendly dental professional. The situation just got worse and worse. 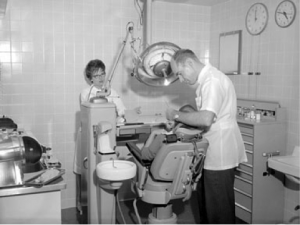 In the meantime dental practitioners developed new techniques to treat nervous patients that focused on alleviating dental fear. They learned how to listen carefully, provide no judgment, take as much time as necessary and provide pain free treatment. I am delighted to say that in the many years that I played dental truant, sympathetic training and especially towards nervous patients became more and more important. Although I remained ignorant of this. My late mother spotted an advert in her local paper. I should tell you that we lived in the university city of Oxford. Fortunately medical advances are often pioneered here. The notice promoted registering with a new local dental surgery, and the line that caught her attention was…. Mum knew all about my ongoing problems and made an initial secret visit to talk to the receptionist and dentist. She explained all about my absolute reluctance to come in person, and that she was very worried about the impact of my bad teeth. The thing that she took away was that the dentist was “a very nice person”. She also said that he had no intention of humiliating me about my dental health or previous history. When she related her visit and conversation with the dentist to me, she also said that he regarded rehabilitating poor teeth to good health and appearance, as the pinnacle of professional satisfaction that he could achieve. He also assured my mum that no case was too bad or beyond hope of resolving. When I finally agreed to visit the dentist, I did it as a shaking grown up man accompanied by his mum. My objections were neutralised one by one and I agreed to a short visit to meet the dentist. I did not agree to being treated! The very next week I climbed the stairs to the surgery, my heart pounding and I was visibly shaking. You will only understand this if you have a similar phobia! The funny part was that mum was accompanying a grown man to the appointment. She had last done this more than two decades earlier! The dentist was a friendly smiling Australian rugby player. He repeated everything mum had said and asked if I would be happy if “he took a quick look”, or he said “we can do it next time”. He told me I had taken a tremendous step be turning up, and that he would fix all of my issues regardless how bad. He assured me that I should not give a second thought to being embarrassed, and that he would love the opportunity to restore my smile. Like a lot of people I had developed a thin toothless grin, and the technique of shading my mouth with my hand when laughing. I walked away with two little tranquiliser tablets and a first real appointment in my diary. More than that I walked away knowing that I would go back, and that this was a person who had shown empathy for my demeanour. One thing I didn’t add here is that my career ambition was to be a radio presenter. I would need to smile on-air, in public at station events, and in publicity photos. My teeth were a handicap, and undermining my confidence and self-esteem. People just don’t expect their favourite personality to have a mouth like the cast of Michael Jackson’s Thriller. Compared with the long ago school dentist, he had what I can describe as a light touch. All the time he chatted and reassured me that things were going very well. There was no pain or discomfort, and he did not show me any of the scary dental equipment or anaesthetic syringes. He kept those out of my field of vision. He had been trained to do this, knowing that just seeing and anticipating their use made the nerves worse! I can honestly say I felt great and told him so. My fears were gone, I had started treatment, and I had not been punished for letting my teeth get into a dreadful state. I had foolishly believed there was no solution, and that I would end up with no teeth at all. I also believed I would get a lecture about my stupidity. He promised me that I would be delighted with my transformation after the treatment plan was completed. He thanked me for my “bravery”, and for trusting him to “sort me out” and he continued that “it would be a privilege” to see me with a broad smile before too long. My poor mum had been in the waiting room, and was emotionally overcome as we walked out together. I’m sure she could see a tremendous weight lifted from my shoulders. In that session I had undergone many fillings and extractions of teeth that could not be saved. The tools to restore my lost smile were crowns, bridges, and a partial denture. These would take ten days for the lab to make. The dentist was able to fit immediate “temporaries” to cover up the gaps. Even so, I couldn’t stop smiling at my own dental work in every mirror I encountered. Compared to my previous failing teeth the transformation and improvement was wonderful. Nevertheless I was absolutely delighted with the outcome. I was elated, thankful for the long overdue dental intervention, and now I was smiling with an open mouth to show off my new found happiness and confidence. My dental health regimen was also transformed with more daily brushings and moderation of sweet things. Now I took real pride in my teeth, and the objective to preserve the ones that I had left. Sometimes a second chance makes us like that. I have a couple of friends who had the same kind of problem, and I shared my turnaround experience with them. Actually motivating them to find and visit a dentist. I can honestly say that Gentle Dental Abroad is the ideal clinic for nervous and price conscious patients. Dr George and his team are very experienced in dealing dental phobic patients. After all it is hard to feel stressed in the calm, free and easy surrounding of Crete. If you have similar problems, you probably think that your oral health is beyond repair, or at the very least the dentist will make you feel embarrassed about your previous history. I have no doubt that your self-esteem and confidence have suffered because you do not have a great smile. I would urge you to get in touch with Dr George Antonopoulos DDS and his team. You can combine your treatment with a sunshine island holiday and still save money over your local treatment costs. In my own case the crowns cost around 75% less. Appointments easily fit in with your leisure and enjoyment activities, and you can go home with a radiant smile. More importantly, the savings can pay for your break on the wonderful isle of Crete. Just think how would you feel if you could walk away from all of that anxiety? This is an issue that is in lot of peoples mind.